“Welcome Home, Tommy!” greeted Private Tommy Wilson, A.S.H., who returned to Brown’s Building, Main Street, High Blantyre, after 4 and a half years abroad. 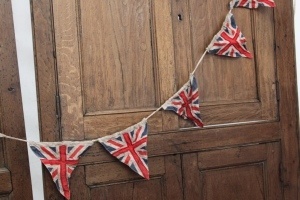 The banner bearing the inscription was the centre of a tenement covered with flags and bunting. However, the most touching incident of Tommy’s return, was the ” Welcome Home, Daddy!” he received from his four-year-old daughter, little Joyce. They were meeting for the first time. Private Wilson was one of six members of the Forces from Brown’s Building which housed 17 tenants. Their total service was 30 years, and their mothers, wives, sisters, and sweethearts were mighty proud of their soldiers and sailor boys.